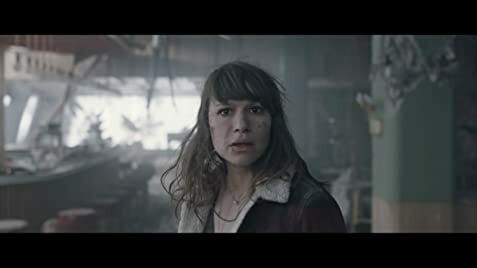 It was not too long ago, back in 2015 when director Roar Uthaug broke Norwegian box-office record with his disaster movie THE WAVE. THE WAVE to me was a disappointment after hearing all its hype before reviewing the film. THE WAVE played like a poor Hollywood blockbuster disaster movie – similar to films like TOWERING INFERNO, TWISTER, EARTHQUAKE and countless end of the world films. It was cliche ridden, predictable and unbelievable. It is bad enough when Hollywood remakes foreign films and even worse when foreign films imitate Hollywood successes. THE QUAKE feels no different. 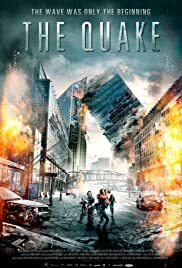 It is touted as a sequel to TH WAVE and it is understandable why. THE QUAKE hopes to cash in on the success of the former film. Norwegian capital. There are recorded quakes from the rift on a daily basis. No one can say for sure, but arguments indicate that Oslo, with its density and infrastructure, is significantly more vulnerable today than in 1904. One plus of the film is that the film does a big benefit for the Norwegian tourism. I have visited Norway twice (the most beautiful country I have ever visited) including Oslo, the capital and the fiords. Both are presented in all its glory. There is a segment with a barge travelling along the wages between high vertical cliffs and another with shots of ultra-modern Oslo. The country begs another visit after viewing the film. is haunted by the event. He still lives in Geiranger, a town just outside Oslo, now separated from his beloved wife (Ane Dahl Torp), daughter (Edith Haagenrud-Sande) and son (Jonas Hoff Oftebro) who relocated to Oslo. But his life is interrupted when a fellow geologist dies in the Oslofjord Tunnel. Upon investigating, Kristian is convinced (of course, and no one believes him of course) that his friend was on to something. An earthquake is about to hit Oslo – and it could kill thousands, including Kristian’s family. Off goes Chicken Little to the rescue when he is proved right. The quake begins 40 minutes to the end of the film. It should have started earlier as the film up to this point is unbearable to watch. Cliche is piled upon cliche with director Andersen stealing from Hollywood films of the disaster genre from CLOSE ENCOUNTERS OF THE THIRD KIND ( an unkempt Kristen looking just like a hazed, unkempt Richard Dreyfuss) to MINORITY REPORT (the image of Tom Cruise with the actress playing his daughter looks all to familiar). He keeps the suspense till past the film’s half way mark, again a tactic already used too often in films like Hitchcock’s THE BIRDS and Spielberg’s JAWS. When the disaster finally happens, it is CGI all the way (that looks at least quite real). Andersen resorts to a few violent segments (a woman being dragged from block of concrete that fallen over half her lower body) to increase the tension. From toppling skyscrapers, to shattered glass, to tilted floors that send humans sliding into space, nothings have on display have not been done before. With the the same actors playing the same family at the centre of the story, credibility has been pushed past its limit. The climax centres on these few people. Where are the rest of the city folk?